Mr Hague says Conservatives are not 'anti-European'. A referendum on the EU treaty would rekindle people's interest in Europe and restore some "badly needed trust" in UK politics, William Hague says. A "no" vote to the treaty, which he describes as "more redolent of Delors than Google", would benefit Britain and the EU in the 21st Century, he said. 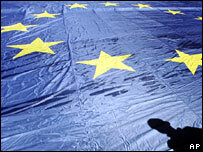 The shadow foreign secretary said it would enable a move towards a more "nimble and flexible" EU structure. EU leaders could then get on with Europe's "real challenges", he said. He spoke out as MPs continued topic-by-topic debate on the bill that will ratify the treaty. In a speech at the Policy Exchange, in London, later he will say it is unfair to attack Conservatives for their "deep scepticism about European integration for its own sake". "Our profoundest concern is that a partly supranational institution must never lose sight of the need for democratic legitimacy," he said. "That is the great danger the EU faces if the EU Constitution under whatever name goes through without the people's democratic consent. "At the least, the lively, far-ranging debate a referendum campaign would bring about would rekindle popular engagement with the European Union, restore some badly needed trust in British politics and re-empower voters. "But a rejection of the outdated approach to Europe embodied in the treaty, more redolent of Delors than Google, would give us the great opportunity to move towards the nimble, flexible structure that would ensure the EU's success in the 21st Century. "It would free Europe's leaders from the prospect of Eurocratic turf wars to deal with the real challenges Europe faces today." Mr Hague also claimed "great chunks" of the treaty were missing any of the "detailed parliamentary scrutiny" Gordon Brown had promised. And he disputed the prime minister's assertion that ratification of the treaty will bring to an end institutional wrangling within the EU, leaving its leaders to focus on issues that matter to their people. "Leaving aside the rather odd argument that handing over large swathes of power to the EU is a good thing because we hopefully won't have to hand over any more for a decade, Gordon Brown's case is severely flawed," he said. It was wrong for the Conservatives to be depicted as anti-European just because they are opposed to shifting power from the nation state to EU institutions, he said. His colleagues were "the strongest advocates" of an EU "where nations work together in a way that strengthens our economies, empowers our consumers and turns our common values into effective action" on issues like climate change and global poverty, he said. However he added: "The great opportunities before us can only be grasped if the EU's focus is not the ever deeper political integration of the treaty."